The basics — Traditionally Bangkok has had a reputation for somewhat functional chaos — in business and on the streets. But with improvements in municipal governance and investment in infrastructure, the city is moving into the express lane. 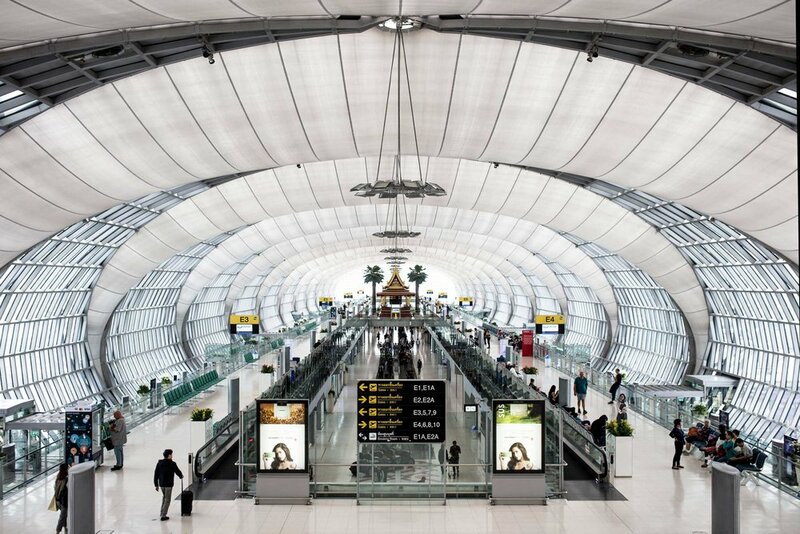 The city — and nation’s — largest airport, Suvarnabhumi (BKK) is likely your entrypoint into Bangkok. Designed by American-German architect Helmut Jahn, the terminal has a rather brutal aesthetic, daringly balanced by generously high ceilings, letting in plenty of natural light. Connectivity is another boon for the airport, with new arrivals finding the cheap, relatively fast train trip into town, pleasantly accessible. Bangkok’s transport mix is diverse, with options from sky to sea (or rather, river). Traditionally relying on boats to ferry commuters across the city, the city’s core is now connected by the elevated 30km BTS Skytrain system, as well as an underground rail network. As you’d expect, busses still fill in the gaps. Taxis, Grab and Uber all have a heavy presence here too. For quicker trips, the back of a motorcycle is always the most efficient option. Keep your wits about you and getting around here is cheap and relatively painless. Many of the city’s residents stay fit by running, and despite being a dense and often harsh metropolis, several major parks dot the city’s centre making an evening jog the perfect way to unwind and meet the locals. Lumphini Park is huge and central, and its pedestrian roads are often packed with runners getting their sweat up after work. But be sure to try the smaller parks too, with many surrounded by some of the best food in the city for that post-run bite. Sleep — Along with retail, Bangkok excels in offering good hotels. A sense of warmth and hospitality seem to come natural to Thais, and you’ll feel it almost everywhere you go. Our favourites are both new and old, a testament to the city’s obsession for hospitality. Many hotels here have good bones, but it’s the staff that make our recommendations and stick in our memories. Despite only having opened in 2017, Bangkok’s new Park Hyatt manages to punch well above its weight, thanks to a team that knows what they’re doing. It probably helps that a crew from the Park Hyatt Saigon, another Aerostorie favorite, have come over to help launch Hyatt’s high-end offering here. Interiors by Yabu Pushelberg bring a sense of warmth to the soaring Amanda Levett building, making it exactly the hotel we were looking for. Stay here if you’re after something grounded. This is the modernist, low-rise antidote to the city’s towering hotel landscape, and with only 51 rooms, it’s also on the smaller end. With teak, glass, slate and stone interiors and an abundance of natural light, it’s a hotel you’ll be happy to linger in. The generous shared spaces make this affordable abode feel even more sumptuous. With fewer rooms than both of our other recommendations (just 39), this Bill Bensley–designed establishment along the rousing Chao Praya river is more resort than city pad. And in a metropolis like this, that might be exactly what you’re after. The Siam is all art deco, and is the charming, characterful escape for when your time in Bangkok is a little less business. The hotel even comes with a city-linking riverboat to boot. Eat — One of Bangkok’s strong suits is surely its food, followed closely by its ingrained sense of hospitality. So it’s a tricky city to match for dining, and is also — pleasantly — gentle on the wallet. There are the starred dining spots of course, all well-deserved, but our favourites tend to be the up-and-comers delivering a little less full-on fine dining. They’re the places where chefs seriously care for the food they’re putting on the table, but are doing so in more intimate settings. Supanniga is no-fuss. A modest dining room, with solid staff, you’ll find the plates here superbly executed. This classic Thai diner in the heart of Thong Lo delivers expertly-made hearty food fit for the cosy space. Several bar seats make it easy to come alone, or to bring a group (but book ahead). This charming little venue on a quiet Charoenkrung backstreet actually has a history as having been an illegal casino, of all things. Nowadays, the area has been transformed into a tiny food and design hub anchored by Jua. With a compact but cleverly prepared izakaya-style menu, this warm, friendly eatery captures everything that’s great about modern dining in this city. It might not be easy to imagine ‘modern Australian’ dining, but chances are, it’s not what you expect. It actually has nothing to do with what’s on your plate. Freebird captures the essence (and we would argue, one of the best parts) of dining in Australia: casual service, cosy interiors, lush outdoor seating and food that is sourced as locally and at as high-quality as possible. What you end up eating here will be good, but as is the Australian way, there’s no pretentiousness. This is fine dining in the purest, most down-to-earth sense. Coffee — It’s hot almost all year round in Bangkok (not that that should dictate how you take your coffee), but this city does a mean cold brew. With a large population of hip young things, you can be sure most quarters of the city have either some kind of speciality coffee joint, or at least someone who’s trained abroad in making the good stuff, so you’re never far from a trendy spot to take a breather. Porcupine is rustic in the nicest sense, and doesn’t feel like it tries too hard. We love the playlist here, and the kittens running around even more. You can easily while away the hours with a book, surrounded by students, professionals and the occasional traveller enjoying their brew in Ari, a charming residential enclave close to the city centre. This attractive little outlet looks like it could be straight out of Kyoto, and the careful attention to detail you’d expect of Japanese design continues inside. Despite its minimalist appearance, it’s a comfortable, relaxed space that makes for the perfect pitstop on your adventures through the city. Nestled in Chinatown’s Baan2459 hotel, Chata is a little oasis, which extends to its greenhouse atmosphere. Chata’s communal tables and abundance of greenery, along with an excellent brew by its expert baristas, make this attractive caffeine pitstop the ideal destination after wandering the neighbourhood’s streets. Drink — This is a city that knows how to have fun, and with an outstanding service culture, Bangkok is a great place to learn how to let got and embrace your more adventurous side. We tend to favour the small, dimly-lit bars where you can chat to the bartender, or engage in deep conversation with your companion. Here you’ll find it all, but some of the best manage to bridge the wild with the cosy. Located comfortably off the beaten track, and with minimal signage, Tep Bar is an eclectic little haven in Chinatown, offering modern Thai flavours (and occasional live music). Fun, and easy to enjoy, Tep Bar is an ideal stop-off after dinner in this vibrant piece of town. But then, the food shouldn’t be ignored here either. This Danish brewer was the little Scandinavian outfit that could. Having popped up all over the word, Mikkeller’s Bangkok outing is a particularly special one. Try a variety of expertly-brewed beers and when you’re done, head upstairs for dinner to the fittingly named Upstairs at Mikkeller. The only bad thing about Sugar Ray is that it’s only open three days per week, but that only serves to make it satisfying when you do settle into a seat here. It’s as much a place to unwind as it is to enjoy the craft of these brilliant bartenders. If you’ve visited the area before, you’ve probably already come across this fun little venue, but it’s a well-run affair that’ll guarantee you some of the city’s best cocktails. Shop — Bangkok has a real way with retail. With plenty of local makers selling their goods in the city, and a strong presence from global brands, the market here is diverse. 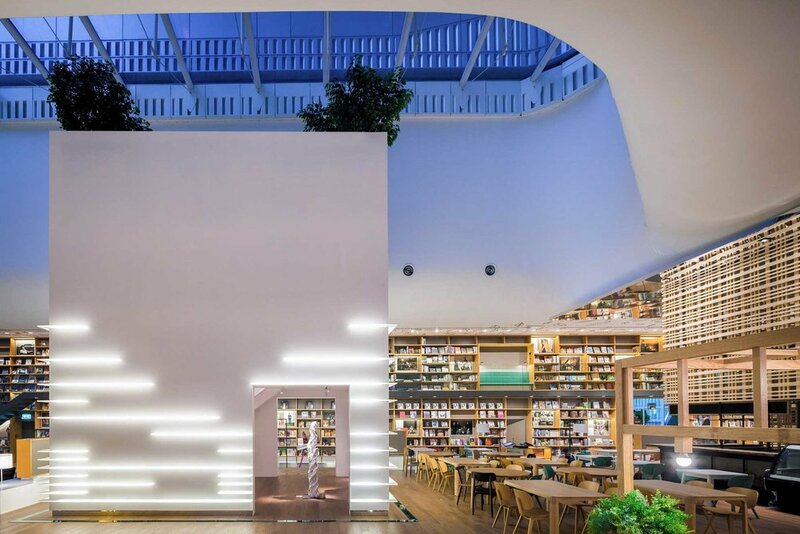 The people behind Thailand’s retail revolution are clever and creative, and it shows: interesting merchandising, smart brand selections and beautiful architecture and interiors are to be seen everywhere. The Jam Factory is many things — cafe, gallery, restaurant, office space, but it’s also a lesson in exceptional retail, namely homewares (Anyroom) and books (Candide). This lush, laidback enclave by local architect Duangrit Bunnag is the ultimate mixed-use space. Ideal for an afternoon spent milling around on foot, this landmark is set beneath huge, beautiful Bodhi trees on the bank of the Chao Phraya, great for an arrival by boat. This beautiful, earthy space is the perfect spot to pick up something that you’ll use everyday, but is intrinsically tied to your trip to Bangkok. The handmade ceramics that dot the space are also used as drinking vessels — Aoon is a cafe too. The food is hearty and cheerful, the drinks good and all that unpolished concrete and timber make for a charmingly sparse venue to spend an hour meeting the work of local makers over a coffee. Like many places in this city, you can eat, drink, shop (and even ditch the children — see Little Pea Kids Commons below) here. Planted right in the middle of Thong Lo, The Commons is the complete package. With food and beverage venues occupying the lower floors and independent retailers up top, you can get a bit of everything here. Its high ceilings, timber, concrete and lush greenery are striking and impossible to miss as you walk past. You’ll find spending an afternoon here is a pleasure. See — You wouldn’t call Bangkok scenic, but then, you probably wouldn’t come here expecting pristine beauty. A city woven together with nests of electricity cables, patrolled by friendly cats and connected by poorly-maintained roads makes for one of the most visually (and olfactorily) stimulating cities on earth. There are the temples, of course, but modern Bangkok has so much more to offer than the typical tourist landmarks, and so much of it is best discovered yourself on foot (or, just like the locals, on the back of a motorbike). Similar to The Jam Factory, you can drink, eat, work and shop here, but it’s really how all these elements come together that makes it worth paying Open House a visit. Soaring ceilings give way to what is essentially the most confused bookshop you’ve ever seen. Countless dining and drinking outlets surround meticulously merchandised books, magazines and homewares. The space even has a built-in (and also beautifully designed) co-working space that is very friendly to those who might only need somewhere to work for the afternoon. This landmark gallery near Siam Square shows the daring, ambitious side of Bangkok’s creative community. Opened in 2008, Bangkok Art and Culture Centre (BACC) is the location of some of the city’s smartest and most interesting exhibitions. Beyond the (numerous) gallery spaces, the centre is home to retail outlets, a cafe and even artists’ studios. While it fits the mould of the globally-conscious contemporary art institution, BACC feels innately Thai from its architectural lines through to the curation of the artworks. 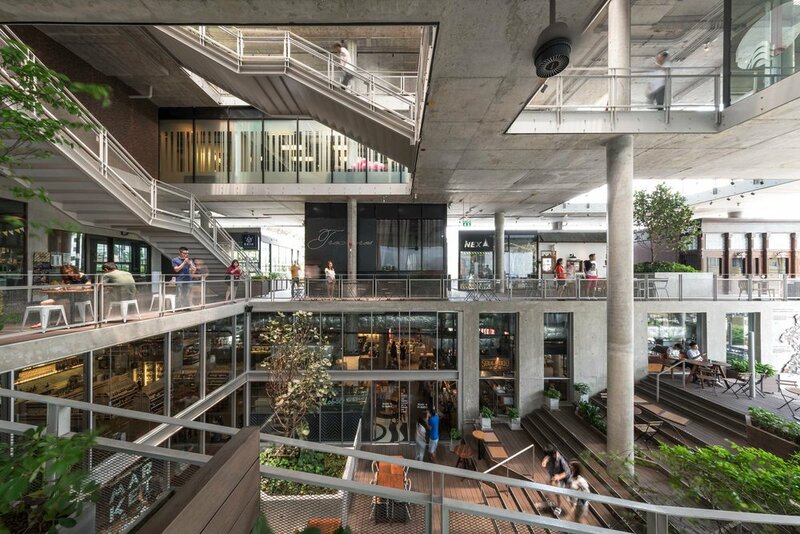 Designed by local firm Department of Architecture, the Thailand Creative & Design Center (TCDC) is one of the city’s biggest creative facilities, with spaces for everything from ideation, and production through to consumption and analysis. With an impressive library, co-working space and cafe, as well as a rooftop garden by landscape architects Shma, the facility is just as enjoyable for those working here, as those just stopping by for a visit. A highly appropriate addition to a city as design-aware as the Thai capital. Families — Bustling Bangkok isn’t always the easiest place to navigate with children, but thankfully, there are many spaces that are designed with children in mind. It’s also very possible for kids to enjoy many of the traits that appeal to adults in this city: great food, interesting retail, colourful views and lush surrounds. The second floor of The Commons is host to Little Pea Kids Commons, an adorably-named area for families to enjoy inside the well-designed retail and dining complex. With events held throughout the week, the space offers parents and children an opportunity to spend time together dancing, making art, cooking or even learning magic. Bangkok eatery Roast also operates the on-site café should you need a caffeine burst to match the energy levels of your young one. Previously an urban farm, this little patch is a generously-sized oasis for young ones to roam. Complete with a second-hand store and a tree-covered cafe, we’re partial to a quick stop-by here on our way to one of the neighbourhood’s many eateries. But equally, an afternoon spent here is a great way to get into the trees without trekking too far from the city’s urban core. Modern Bangkok has many personalities, but one of its most historic is that of its riverside. With several options for navigating the waterways, you’ll come across everything from bustling marketplaces to residential stretches to speedy expressways as you traverse the city’s rivers. Many spots around the city are actually best accessed by boat, so it’s a splendid way to build a scenic route into your family’s lunch or dinner commute. Events — Visit any time of year and it’ll generally be pretty hot and humid, but that doesn’t matter; everywhere is relentlessly air conditioned. Stopping to see a festival, exhibition, show or conference is sometimes the best place to be when you can’t take the heat any longer in this vibrant, happening hub. Stories — People, places, ideas and flavours from Bangkok. Originally based in Melbourne, Jess Barnes is a straight-talking Antipodean who lives in the Bangkok ’burbs. After starting out as a butcher, Barnes has steadily worked his way up the food chain (and across Asia). He sat down with Aerostorie in Thailand’s bustling heart to talk about his life so far. Born in France, Thomas Menard is a gallery owner and entrepreneur based in Bangkok. Living in London and Paris and travelling through Asia, Menard speaks to Aerostorie about quitting his job in favour of more excitement and the benefits of injecting more art into his life.